LOS ANGELES, June 27, 2018 /3BL Media/ - CBRE released its eleventh annual Corporate Responsibility Report. 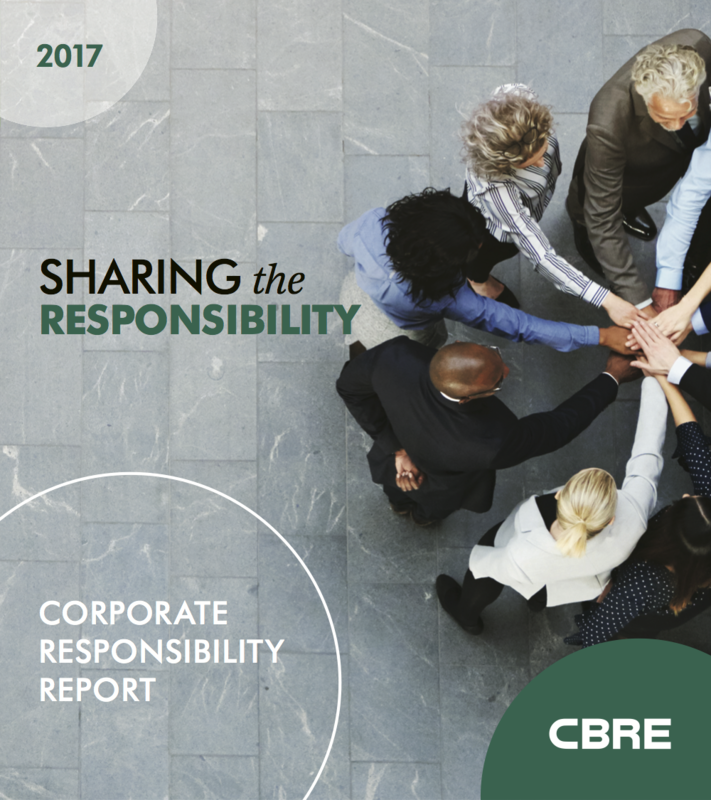 The 2017 report – themed “Sharing the Responsibility” – highlights CBRE’s many accomplishments as a leader in responsible business practices within the commercial real estate industry. CBRE’s commitment to creating a more diverse and productive work environment – where people of all backgrounds can thrive – was recognized by both Forbes and Fortune magazines, which included CBRE among the top companies for diversity and inclusion. 118 CBRE offices totaling 3.4 million square feet, or approximately 77 percent of our global occupied space, are certified under green and/or healthy building schemes such as LEED, BREEAM and WELL. During 2017, CBRE registered and benchmarked a record-breaking 6,197 buildings, representing more than 370.7 million square feet, in the U.S. Department of Energy’s ENERGY STAR program. CBRE global corporate and employee donations totaled more than $15 million in 2017. This includes support for CBRE employees who were directly affected by the unprecedented natural disasters that struck the U.S., Mexico and the Caribbean, and aiding in disaster relief and local rebuilding efforts. “CBRE is increasingly integrating corporate responsibility initiatives into our daily business practices. As a result, our business solutions are creating environmental, social and governance benefits for our company and our communities and better outcomes for our clients,” said Bob Sulentic, CBRE’s president and chief executive officer. “Sharing the Responsibility” was produced in accordance with the Global Reporting Initiative (GRI) Standards: Core option and includes the company’s progress toward implementing the Ten Principles of the United Nations Global Compact. The report also contains disclosures for the Real Estate sector that were developed by the Sustainability Accounting Standards Board (SASB). Earlier this year CBRE was recognized as one of the 100 Most Sustainable Companies in the U.S. by Barron’s and was named one of the 2018 World’s Most Ethical Companies® for the fifth year in a row. CBRE also received an EPA ENERGY STAR® Partner of The Year — Sustained Excellence Award, the eleventh consecutive year of EPA recognition. More information on corporate responsibility at CBRE can be found at www.cbre.com/responsibility.